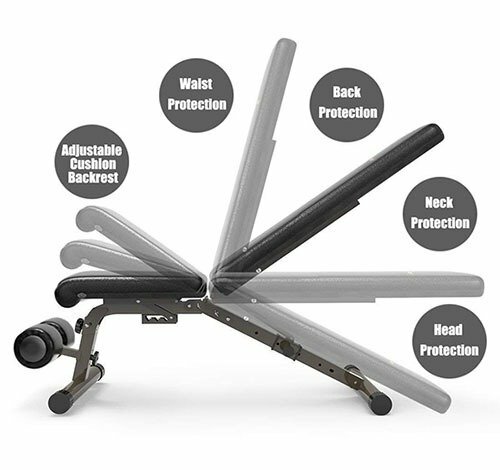 As I was searching for fitness accessories brands that offer the best adjustable weight bench, I stumbled upon FEIERDUN. I don’t know if you have ever heard about this name brand but FEIERDUN has a reputation for offering top-notch fitness products. Reputation and facts aside. Today, I will be reviewing FEIERDUN Adjustable Weight Bench to see whether it is worth your money or not. Just so you know I don’t own this fitness equipment in my home. However, I went searching for it at local gyms and luckily I came across one that has this stunning equipment. Of course, I tried it and I will share more on ‘My Experience’ below. But first, let’s begin the full review of FEIERDUN Adjustable Weight Bench. 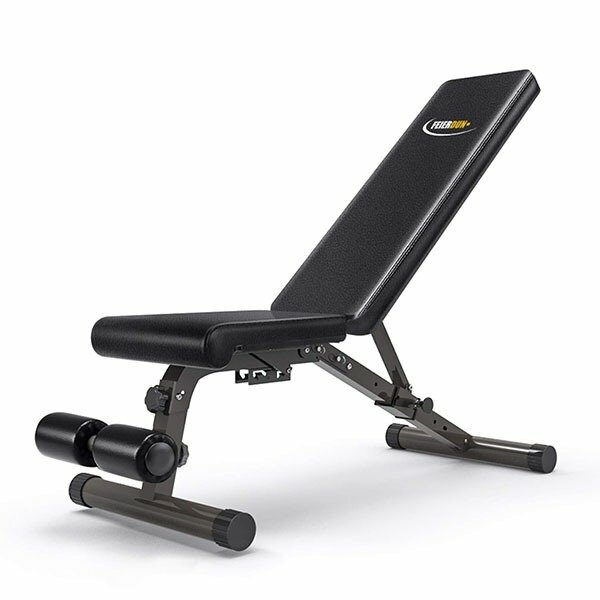 FEIERDUN Adjustable Weight Bench is versatile as it has 3 seat positions and 5 back positions. It has a comfortable and ergonomic design with high-density padding seat which reduces muscle fatigue during training. The whole bench is made of heavy-duty steel designed to withstand a load capacity of 680 pounds. This bench can adjust to five different positions for total versatility: flat, incline, decline, 45, 90. The folding feature can save you up to 50% of space when the adjustable weight bench is not in use. I was among the very first people to use this adjustable weight bench at the newly opened local gym. So, I guess it was still new when I first tried it. Anyway, by the look of it, I could tell the adjustable weight bench was very sturdy. After sitting on it, my theoretical thinking was confirmed to be true. I felt quite stable and comfortable sitting on the high-density seat. The back of the adjustable weight bench is also well padded, making it comfy on my back. During my workout, I was able to adjust to three different positions without too much hassle, which enabled me to target the entire muscle groups in my body. However, to reduce the risk of injury, I would advise you warm up fully before you start using this bench. What impressed me the most about FEIERDUN Adjustable Weight Bench is that it is perfect for beginners. You don’t have to be a gym rat to use this equipment. Anyone regardless of their workout history or experience can use this bench. This particular bench is lightweight which makes it look unsuitable for heavier people. However, the manufacturer states that this bench is capable of withstanding a weight of 680 pounds. Stable –> The heavy-duty steel frame of this adjustable weight bench is quite stable, just like it is described by the manufacturer. Considering the fact that this lightweight bench has 680 pounds load capacity, it just has to be sturdy to withstand heavy loads. The FEIERDUN Adjustable Weight Bench is built with 50 mm by 50 mm thicken supported pipe which guarantees it will withstand 680 lbs weight capacity. 5 bench positions –> The bench has 5 different positions to choose from. Depending on your workout, you can either choose flat, incline, decline, 45 degrees or 90 degrees’ positions. It is very easy to modify the backrest angle. All you have to do is pull the latch and adjust the backrest angle to your preferred position. No wobble –> At first, I was concerned if this lightweight bench would support my weight of 160 lbs. I was amazed by the sturdiness of this bench as I was able to perform different workouts without it wobbling. As you assemble this bench, make sure you tighten the screws to avoid the problem of wobble. Thick and firm padding –> The backrest and seat have thick, firm padding which makes it very comfortable to sit on. The firmness prevents the padding from compressing too much under heavy loads. Not stable enough for people who weigh more than 300 pounds as it wobbles when you put heavy weights on it. The manufacturer states that it is easy to set up the bench but in truth, it can be tedious and time-consuming to assemble it. Not ideal for people who are 6 feet and taller. FEIERDUN Adjustable Weight Bench is great for a full body weight workout. You can use it to train your chest, abs, shoulders, back, and more. This adjustable weight bench is perfect for home use if you are not too bulky or tall (6 feet and above). However, if you don’t meet these requirements I would suggest you look for alternative benches that best suit your needs, for example 5.1S by Bowflex.